Is it taking you too long to hand-wash and air-dry your clothes? Maybe this is a sign that you own too many clothes. Lately we’ve been having problems with birds. Specifically, birds have been landing on our clotheslines and doing what birds do all over our clothes. Which means we have to rewash them. And I’m embarrassed to admit this, but for whatever reason, Cate hasn’t been completely enjoying the amount of time she gets to spend doing laundry. This photo is from a Marine base in Afghanistan, so these Marines sort-of know what I’m going through. I tried using a slingshot on the birds, but so far all I’ve managed to do is shoot out one of my neighbor Noah’s picture windows. Fortunately he wasn’t home at the time (and hopefully he doesn’t read this blog! Ha ha!). I told him later I thought it was probably anti-Slow Laundry people shooting at my house and missing. One of my coworkers suggested that we rinse our clothes in water with diluted Tabasco sauce, to keep the birds off. But if anything, diapers soaked in Tabasco sauce made our son’s diaper rash even worse, so we scrapped that. We tried all these on our son’s diapers, but nothing worked! I emailed John Sage and he advised that the urea in bird droppings can be used to make bleach, so maybe when there are birds around, I should try hanging up just whites. The problem is, we’ve been practicing Slow Laundry for a few months, and none of our clothes are really “white” anymore. For the time being, we’ve switched to stringing our clothesline between the bottom of the stairs to the top of the stairs. But our daughter has been trying to zipline on it, so we need a solution to this bird issue pronto. Any ideas are welcome, post in the comments section below. You don’t need to separate colors from whites when you’re hand-washing. Unless you’re worried about the colors bleeding everywhere. Ever since we started washing our clothes by hand, I feel like I’m being transformed from a soft, hairless caterpillar who relies on washing machines into a powerful, beautiful butterfly who does laundry how he wants, when he wants. Or maybe I’m transforming from a man into a wolf, but a wolf who does laundry. In any event, I’m becoming something better, something more raw and masculine, with every hour I spend doing laundry. This is basically me, before Slow Laundry. I keep my hands wrapped in bandages except when I’m doing laundry, which makes it hard to type, but my company has refused to provide me with a surrogate typist. I’ve filed an EEOC complaint, so, fingers crossed (metaphorically). Cate’s early Mother’s Day present! John Sage says in “Truth and Lyes” that this kind of blister outbreak is inevitable, and you just need to break through the “blister barrier” to reach the land of rough, capable hands on the other side. Wet clothes can be dried on anything. Do you have a fence? A mailbox? Bushes? Gutters? Garbage cans? Then you’ve got places to dry clean clothes! $389.99 well spent! Because I learned an important lesson: bows are hard to use. Since buying animal fat in bulk for soapmaking has proven to be an issue, today I went on my first expedition into Rock Creek Park to collect fat from wild animals. It wasn’t a huge success. First, I probably had the wrong weapon. I’d bought a compound bow from a sporting goods store at the Pentagon City mall. People looked at me pretty funny when I was bringing the bow back home on the metro, so when I took it into Rock Creek Park, I wrapped it in a garbage bag and put a post-it note on the bag that said “lamp.” So far, so good. Once I got into Rock Creek, things went downhill. First, I accidentally emerged from the woods into a picnic area hosting a family reunion. 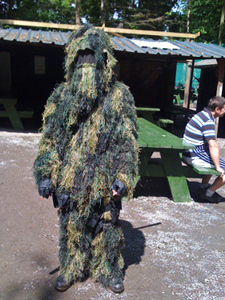 I was wearing a “ghillie suit” I’d also bought at the sporting goods store, and between the bow and the ghillie suit, people at the picnic freaked out and started running. Well, you know what, people? We’ve been hunting in the woods a lot longer than we’ve been having picnics! If you don’t want to see a hunter, maybe you should go have your picnic in the food court at the mall. A relaxing day at the park. Anyhow, I went back into the woods, and after about an hour I saw a squirrel. Now, here is the thing. Squirrels are really small. So I shot all my arrows at the squirrel, but didn’t hit him. I also wasn’t able to find any of the arrows, which I think ended up leaving the park and crossing 16th Street. I decided the bow was probably useless for my purposes. But I didn’t want to just throw it away. So I “paid it forward” by giving the bow to some kids waiting at a bus stop. And of course their mothers threw a fit. Don’t even get me started on helicopter parents. To make a more earthy lye, try substituting urine for water. You’ll be surprised what happens! These days, people tend to think of laundry as a lonesome and soul-crushing chore. But when you make the choice to hand-wash your clothes, this “chore” turns into a chance to spend hours and hours of quality time with your family, with your community (if you are fortunate enough to live near a public washhouse), and—most importantly—with your dirty clothes. Babies love to do laundry! First, I put the dirty laundry in the bathtub to soak. Next our infant son beats the clothes with a rock to get the stains out. Then I scrub the clothes on the washboard, because frankly, our son doesn’t get all of the stains out. My husband, D.J., wrings out the soapy water. Our 2-year-old rinses the clothes in a washbasin filled with piping hot water. Our 2-year-old wanders off to play in the dirt, so I have to finish up the rinsing. Finally, I hang everything on the clothesline to dry! I know it sounds like a lot of work, but all the while we are talking, laughing, and getting to know each other. For example—just last weekend we learned that our 2-year-old has some kind of phobia about piping hot water. Who knew! The six hours we spend doing laundry each Sunday just fly by. And after a full day of satisfying work under a hot sun, you better believe that we all get a good night’s sleep! But not on our sheets, because they take forever to dry. Can’t decide how much homemade soap to use? Use it all. It probably isn’t all that effective.